Unprecedented power and responsiveness, paired with easy, built-in security, means you can work, play, and create as quickly and seamlessly as your heart desires. 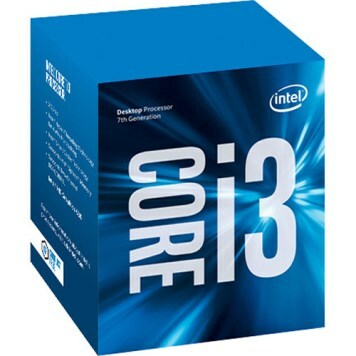 The Core i3-7100 3.9 GHz Dual-Core LGA 1151 Processor from Intel has a base clock speed of 3.9 GHz and comes with features such as Intel Hyper-Threading technology. This processor features 2 cores with 4 threads in an LGA 1151 socket and has 3MB of cache memory. Having 2 cores allows the processor to run multiple programs simultaneously without slowing down the system, while the 4 threads allow a basic ordered sequence of instructions to be passed through or processed by a single CPU core. This processor also supports up to 64GB of DDR4-2400/2133 and DDR3L 1600/1333 RAM at 1.35V, has AES New Instructions, 14nm lithography, and utilizes 7th Generation (Kaby Lake) technology. Graphically, the Core i3-7100 3.9 GHz Dual-Core LGA 1151 Processor uses integrated Intel HD Graphics 630.